Last November, Pope Francis made Archbishop Patrick D’Rozario of Dakha a cardinal, making him the first cardinal ever of the Church in Bangladesh. The Pope has also strongly hinted he intends to visit both Bangladesh and India sometime in 2017. For the often-embattled Catholic minority of Bangladesh these are great signs of hope. Aid to the Church in Need recently spoke with Archbishop Moses Costa of Chittagong, Bangladesh. The Catholic Church in Bangladesh is speaking up for the rights of the country’s ethnic minorities, bemoaning the fact that ethnic and religious minorities are not explicitly mentioned in the nation’s constitution. 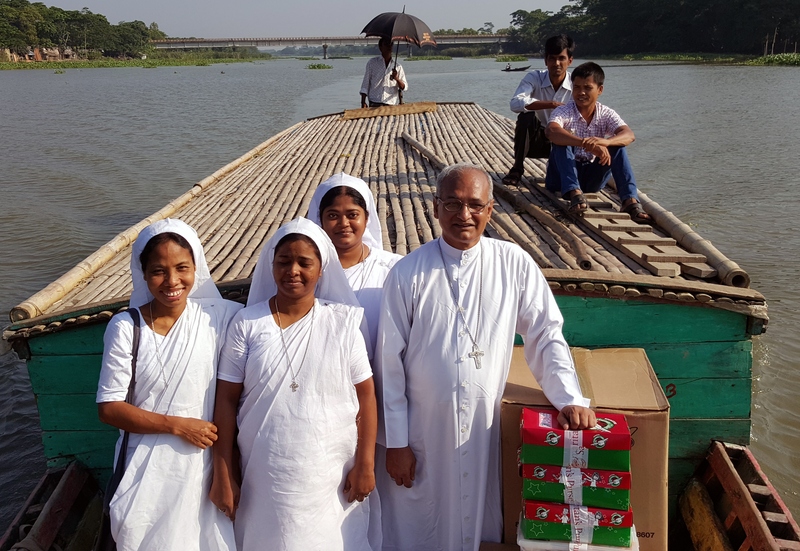 Archbishop Moses Costa of Chittagong told international Catholic charity Aid to the Church in Need (ACN) that “the government does not acknowledge their rightful existence and ignores them, so that they have hardly any possibility” of bettering their position in society. He added that minorities are often discriminated against in the workplace, even in some schools, since they do not speak the national language—and “when the ethnic minorities suffer, the Church also suffers, for 60 percent of our Catholic faithful belong to this part of the population,” the bishop said. He noted that he Catholic Church is the only institution standing up for the rights and human dignity of the minorities. Archbishop Costa described how, in the wake of severe flooding last year in the so-called Chittagong Hill Tracts, a mountainous province within his archdiocese, the government refused to aid the ethnic minorities living there and denied the existence of the crisis. He also criticized the exploitation of the tribal peoples in the ship-breaking yards of Chittagong Harbor, where unseaworthy ships are broken up into their component parts for reuse in other ways. For example, the steel components are dismantled and used as structural steel in buildings. “This work is carried out under very hazardous conditions and claims innumerable human lives. But I am not permitted to visit this place, because the authorities have refused me permission,” the archbishop charged. Asked about the attacks on Christians and on Church properties which have been escalating in the overwhelmingly Muslim country, the archbishop said that a mixture of political and religious motives fuel the violence. On the one hand, there often attempts to unjustly gain possession of land and properties belonging to the tribal peoples, who are often Christians; however, the prelate said that some attacks have a religious aspect, a factor that is becoming more pronounced. There are a many different Islamic groups and organizations in Bangladesh. However, there are also reasons for Catholics to rejoice. When Pope Francis in November 2016 made Archbishop Patrick D‘Rozario of Dhaka a cardinal, not only were Catholics “overcome with joy,” but even the non-Christian population was “very happy,” Archbishop Costa reported. The government also appreciated that “the Pope was according the country a special degree of recognition and honor.” That respect was also evident when the Diocese of Chittagong was elevated to become an archdiocese in February 2017. Thanks to the two events, “the Catholic Church was given greater importance” in the country, he said. “Generally speaking, and despite its numerically small size, the Church in Bangladesh makes a significant contribution to the educational system through its schools and is likewise very active in the area of healthcare. It is widely respected by many people as a result,” said Archbishop Costa. Muslims account for almost 90 percent of the population of Bangladesh, 156 million with Hindus making up the second largest religious group at 9.5 percent. There are 270,000 Catholics in the country. Last year ACN gave around 560,000 Euros in support for the Catholic Church in Bangladesh.